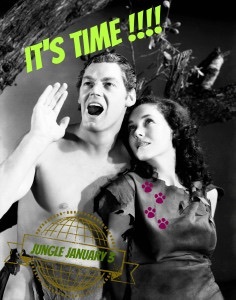 It’s Jungle January! – Nice dress! Thanks, I made it!! I hunted through my stash but came up empty-handed and having blown my fabric budget for the next few months already there was no way I was going to go near a fabric shop or on-line site! My sister, J.A.M. – JOANNA’S ARTISTIC MUSE, came to the rescue. She hunted through her stash and bagged a winner for me. 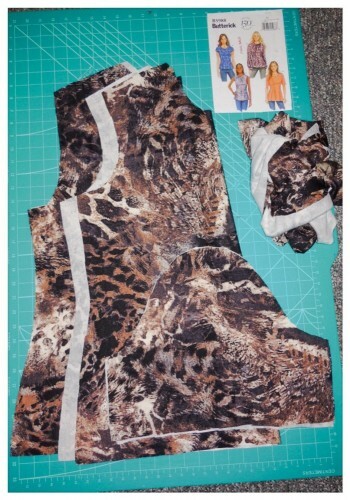 Just enough Jungle print for my favourite TNT pattern, Butterick B5988. My three easy pieces are cut out. I add some thread and some bias tape and I am done … and with not much fabric left over neither!! 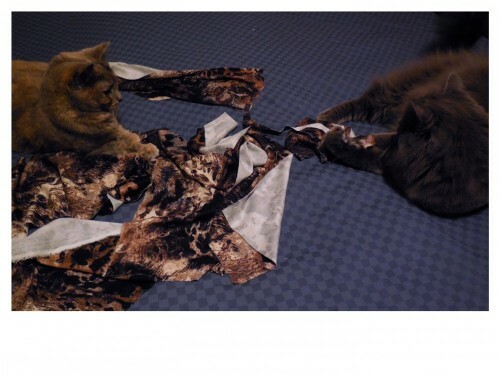 I had a bit of a scare though, I left my fabric bits and pieces lying around unguarded and the Big Cats moved in for the kill. 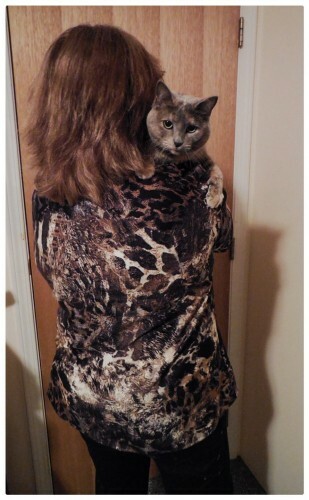 My Jungle January is finished now and I plan on blending in with the Jungle, safe from all feline predators. This is Sophie, the skittish one. And on the right is Simon. Yes, his tongue is sticking out, as it quite often does! I have made this pattern many times without problems. This time i left out all the darts for a more casual top. I have altered the length too sometimes. For more Jungle Fun head on over to Pretty Grievances and have a peek at the wildlife! Thank you! I am sorry to say my stash has grown in the last few months. (Not really sorry though!). I am going to have to have a sincere but firm talk with myself, especially since I must go buy a zipper today!! Thank you! And Thank you for organizing this! It has been fun! Thank you! I don’t know yet what they would do if they got their paws on some imitation furry fabric! 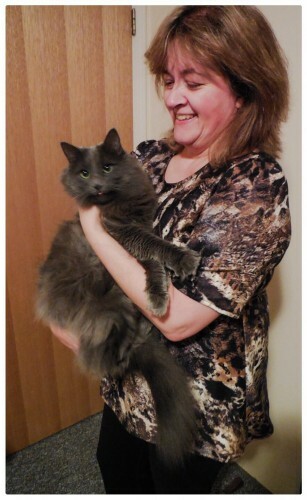 Very nice, the top looks great on you and your kitty cats are so cute! Thank you! There was definately more fun than sewing going on this tme! I love your top! and the cats are beautiful! I have to get that pattern; quick and easy and versatile. Thank you! It is my TNT. They recommend using other woven fabrics, but I have always just used a knit and made adjustments to make it smaller/tighter. I don’t want it too tight anyway! Lovely top and excellent accessories! Haha, funny how the accessories are harder to take care of than the top! Great top. Love that fur. Both on the top and on the kitties. Gorgeous. I never thought I would wear jungle print but you make it look good. I also like the concept of making the top more casual by not putting in the darts. Now “pink” that may be a different story altogether. I’ve met the cats and they are fun. Thank you! Funny we have similar tastes! I have one article of “jungle” clothing–a scarf. I always feel a little “out there” when I wear it, it’s a fun piece. Your top looks fabulous. I loved Sophie’s pose–arched back, the “I dare you to come here and take this from me” look. Who knew jungle prints could be so much fun! Ya, who knew! I might even get another one going next Jungle January! Lovely top, it’s nice to use a TNT pattern and be sure for the results. I’m new in sewing and don’t have a TNT just yet! Thank you! This one just sort of happened last year! I have yet to find a favourite pants pattern, but I am getting close, maybe this year? The rest … I am just all over, trying everything! Nice! I might try this pattern too – it looks like a nice easy one to tackle. My hubby said – you are not sewing this weekend again are you? I might have to sneak in a quicky while he is golfing!! Yup! That’s usually how it goes! I usually get comments from my husband that start or end with “you and your sewing machine” like she is a family member! BTW the pattern calls for a woven fabric, I used a knit. The woven might be easier to work with. Thank you! I’m excited for it this year. I have two animal print fabrics. Hopefully there is time for both! 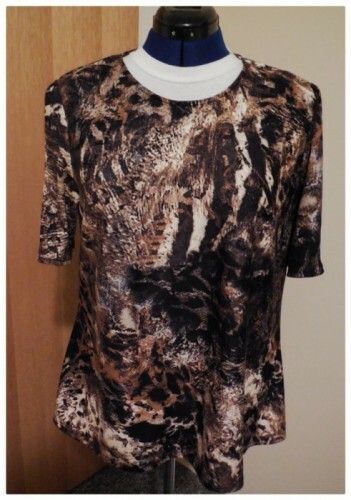 It is the only time of year I do animal prints!